From as far back as I can remember I have always enjoyed painting and making things. After school on the Isle of Wight I went on to study at college. First a Foundation in Art at Salisbury College and then at Falmouth School of Arts in Cornwall where I studied for my HND in illustration. Falmouth was a beautiful location to study in and I quickly found inspiration in the rugged coastline and the contrasting bustling tourist trade. I spent sunny afternoons painting on windswept beaches and rainy afternoons sketching characters in tea rooms. My ambition was capturing the spirit of the moment with colours and peoples expressions. After graduating I left England for Norway, where I ended up working for two years. I continued to sketch with more vigour than before as it seemed more important to keep the memories in an alien environment. Due to the cold conditions I got quicker at painting and filled many sketch books with pen and watercolour pictures and accompanying prose. Upon returning to the UK I took up part time work and started working freelance as an artist, putting pictures in local galleries and gaining commissions from people I met whilst painting. I also studied for my certificate in education and started up a painting club which I have continued to run every Thursday evening from my house in Gurnard. I now work full time with my artwork splitting my time between commissions, illustrating and writing a book for children, producing a range of cards for sale and painting pictures for galleries. I am now more determined than ever to succeed, as I continue to find it very rewarding when people gain pleasure from my work. All prints are limited editions and are hand signed. Prints are produced at my studio using archival quality inks on archival matte paper stock and should provide a lifetime of enjoyment when looked after correctly. As with any artwork, prints should be kept out of direct sunlight, away from areas of high humidity and sealed behind glass. Around 80% of my paintings are commissions. Whilst I can paint just about anything I generally prefer to paint families and pets in landscapes, as well as house and boat portraits. Usually a client will give me a list of what they would like included, choose a painting size and then decide on a location and time of day for the painting. I normally then work on location for four to five hours to get the overall composition and layout sorted, taking a large number of digital photos to allow me to complete the picture back in my studio. 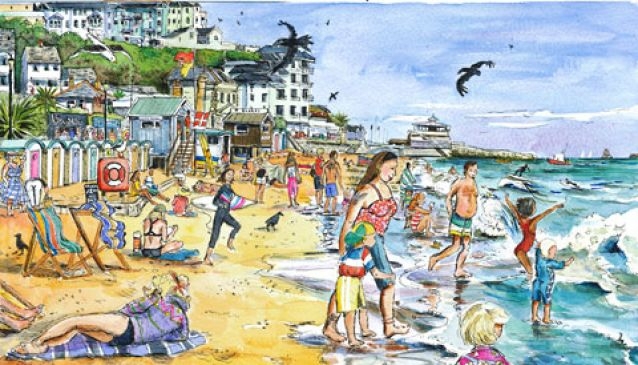 Once the work is finished, clients can choose to order additional cards and prints of their painting for family and friends - often as presents for birthdays or Christmas.